whimsey | Random moosages as I see fit. I’m going to assume zombie turnips are vegetarians. Not really sure though. 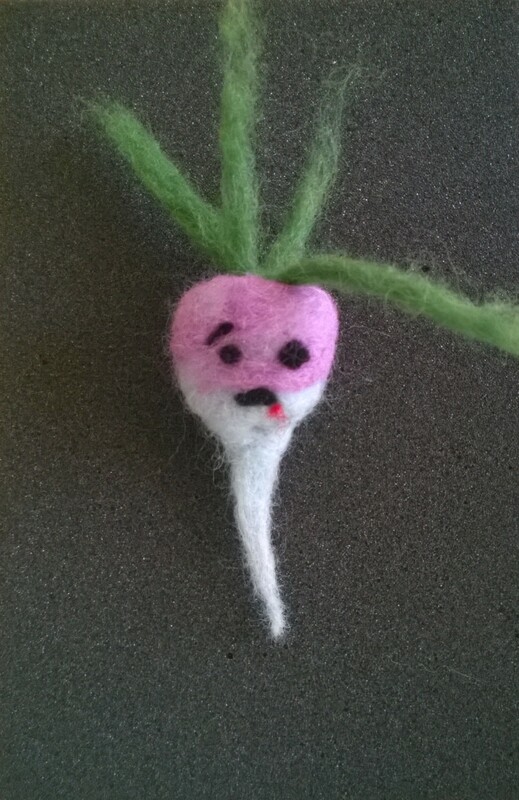 So, I made a zombie turnip! I was inspired by this Whimseybox that I did not purchase because they released this box after I put my account on hold. Granted, their turnip is happy and mine…is a zombie. Mine is obviously better. Anyway, I had all the stuff I needed on hand already. You may remember that I’ve previously done some needle felting. And also there’s the peacock in this gif. This was from a post with actual spiders in it and not just the fat yellow one I drew, so I didn’t link. Since I already had all the stuff I needed, I went ahead and made a zombie turnip. I figured it would be an interesting activity for a Friday. Possibly even with the younger kids on Sunday. I know someone who allowed a two year old to do needle felting, so it can be done, especially since the kids I take care of are considerably older than two. 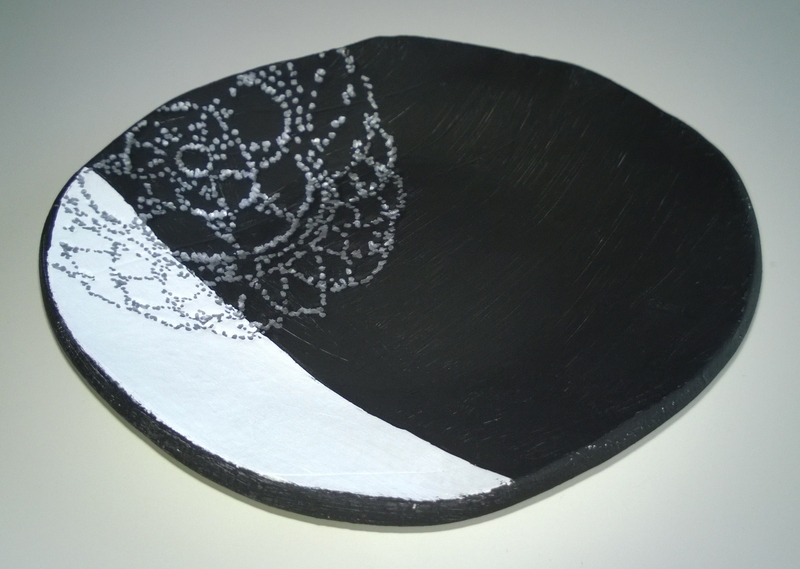 Ok, finally finished the textured clay dish I made almost two months ago. It really didn’t take that long and it’s shameful that I let it just sit on my work table collecting dust this whole time because either I was lazy or was going through a motivational crisis. I smoothed out the edges with an emory board. Not the one they had originally included in the box, because I had put it away and didn’t feel like looking for it. I just picked up the random one that’s been sitting on my desk and used that one. I don’t actually use them on my nails, so getting clay in all the grooves doesn’t really bother me. Next, I had originally planned to highlight the textured portion with some metallic paint or ink. But then I was thinking that it wouldn’t look very good against just the white background of the clay. So I decided I would paint part of it a darker color to provide some contrast. But then I decided to first give the whole dish a base coat of titanium white so everything would be a nice bright white. The clay itself had a bit of a grayish tinge. After that, I painted a coat of black over part of the face and around the sides. The bottom is still white, if you’re curious. And then I highlighted the textured portion by dotting it with a metallic silver Sharpie. The whole thing is sealed with Polycrylic (semi gloss). Tada! Now I have something to put my keys in? At least it stands out against the white of my worktable. And FYI, it doesn’t smell nearly as bad as it did when the clay was still curing, but it does still smell. And now it also smells like acrylic paint and Polycrylic.